Entrepreneurs, Enterprise People: do you know that the very secret of existing and operating as an enterprise lies in the fact that your enterprise belongs to a Value Chain? In fact, the secret of success for any new-world enterprise is to be "...at the right moment in time in the right Value Chain..." and to exploit in full its potential. The so called Value Chain is that continuum of Suppliers and Suppliers of Suppliers on the "supply" side of the enterprise - and of Clients and Clients of Clients on the "demand" side. It's called Value Chain because Value must be associated to each link in the Chain. 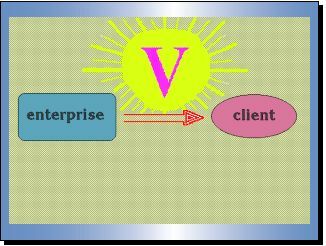 In every relationship or transaction between supplier and client there must be a transmission of Value, flowing from supplier to client. Every link in the value-chain is an enterprise (until the end-user is reached on the demand side). Every enterprise in the link is supplier of one or more clients, and client of one or more suppliers. The ideal condition is achieved when maximum value is transmitted at each step (in each link of the chain): this is called the "lean condition". The involvement and integration of Suppliers on the "supply" side. In steps, through adequate strategies and policies (falling under the Vendor classification, evaluation, grading and up-grading discipline), suppliers are "up-graded" in their status. From Normal Suppliers (motto: "...shop around for the best price...."), well identified suppliers are brought to the status of Performing Suppliers (motto: "....let's improve together..."). The next step is to upgrade selected suppliers to the status of Integrated Suppliers (motto: "...the operational process starts at supplier's premises...."). We are in a situation of Operational Comakership. In the most successful situations, suppliers are further up-graded to the status of Partner Supplier (motto: "....let's make business together...."). We are in a situation of strategic integration, the so called Business Comakership. Several tools, including sophisticated web-based software, allow today the complete, operational integration on the supply side. In all up-graded situations the target is joint and shared: let's deliver the utmost value to our clients. The involvement and integration of Clients on the "demand" side. The combination of the two initiatives above. This gives origin to the demand and supply chain integration. The insertion and deployment of the Value Chain principle inside the enterprise's walls (more »). This brings a new perspective to all employees. The enterprise is now seen as a number of processing units, both in parallel and in cascade, each having well defined internal suppliers as well as well defined internal clients. Most upstream units relate directly to external suppliers, while most downstream units relate to external clients. People in processing units have then clear and full details of their scope and of their "area of purpose" : inputs, outputs, suppliers, clients, and criteria for measuring efficiency and effectiveness of processing units finally are brought to the light. People finally can see their clients and clients of their clients, and relate their work to the value they deliver to clients (rather than to jobs, tasks, roles, functions, and the like). People are now given the conditions and the pre-requisites to become value producers. The above is achieved also and primarly deploying healthy Lean Thinking (more ») principles all along the Value Chain. In that way, waste is gradually eliminated and value transmitted is maximised (lean status).